I’m dropping by to say thank you for your posts on this, including this. They have provoked a lot of reflection for me. As just another journo trying to make sense of the science, it wasn’t obvious to me at all that Shakhova’s work is speculative. That some prominent Arctic scientists seem to agree with her only made it seem more incredible to me that her assertions about gas hydrates at the ESAS are not actually confirmed, but rather hypotheses. Yours and Gavin Schmidts comments have now made this point really clear. I didn’t really get this before – the language that has been used by Shakhova and others on this issue has been almost definitive in tone (there *are* this quantity of hydrates etc etc). On twitter when Gavin first responded saying ‘but there’s no evidence for this’ after I’d sent a link to a paper by Shakhova and Semiletov talking in some detail about methane clathrates at the ESAS and permafrost, I didn’t grasp that their discussions were actually not proven. I believed shallow methane hydrates were found disassociating at the ESAS because this is what has been stated repeatedly as if it is fact. Even with the caveats and qualifications, the existence of the hydrates has been stated again and again – I took this at face value and couldn’t quite believe that it would be possible for scientists to make such statements with such seeming certainty and be wrong. Especially given that there are quite a few other specialists lending credence to the idea. People like Wadhams for instance, or the 20 authors of that Russian review paper, don’t use speculative language. So it has, for me, been a challenge trying to understand why these guys treat Shakhova’s work as non speculative while many others are unconvinced. As an outsider and non scientist, this comes across as a scientific disagreement / but if you, Gavin and others are correct then there is more going on here, and it would seem to me that some irresponsible claims are being made, and that reasonable speculation is being presented as fact. I’m still trying to understand this and make sense of the extent to which the assertions lack evidence. Some of the papers refer to drill cores and samples and hydro acoustic analysis etc but I’m not equipped to grasp how solid or hypothetical the results of this sort of empirical fieldwork is. So I plan to come back to this subject looking more closely at the speculative nature of the claims about methane hydrates at the ESAS in particular – for now, though I need to take a break from the issue! But I will probably come back to you with some questions for a follow up piece. If you are right about all this, then you are also right about the challenges posed for science / enviro journos. I’m now starting to experience that sense of dismay you describe as its dawning that what some prominent scientists are saying about this issue might not actually be justified by available evidence. Thanks for your persistence on this one. I've been trying to figure out two things that I've been following from Mr Ahmed which is the methane danger claim, and the 2016 ice free summer claim. The methane one seems to have been retracted due to uncertainty about the science, but Mr Ahmed made an article in the Guardian after that reiterating the possibility of ice free summer by 2016, citing the US Navy and Peter Wadhams. 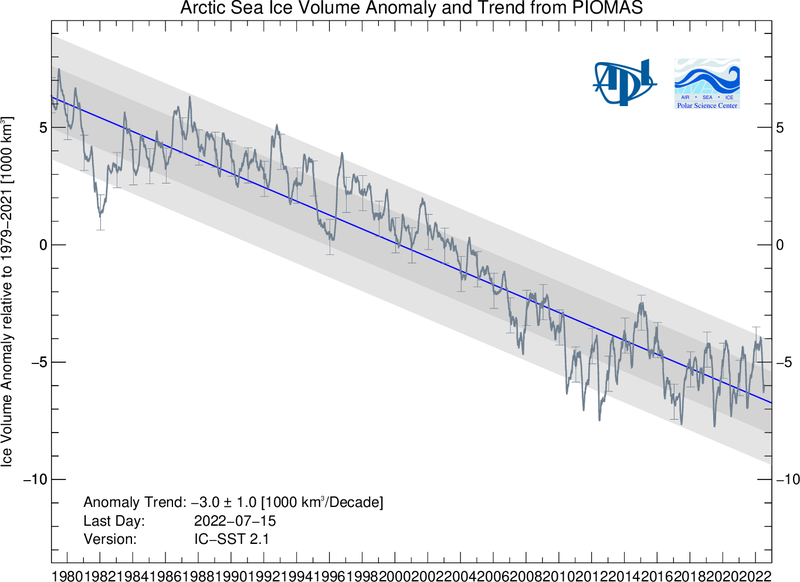 Are we still on for an earlier than expected ice free summer, or has Peter Wadhams et al made a serious mistake here ? I guess we'll know by 2020, but I've got good reason for not wanting to wait that long to get a good picture of this. I hope posting on an old entry doesn't mean my comment is lost. I think that's not likely at all, and for myself I have altogether stopped taking Wadhams seriously, but of course your mileage may vary. I think this is an extraordinary claim and requires a strong argument and haven't seen one, but perhaps I missed something. Do you have the URL for Nafeez saying this? 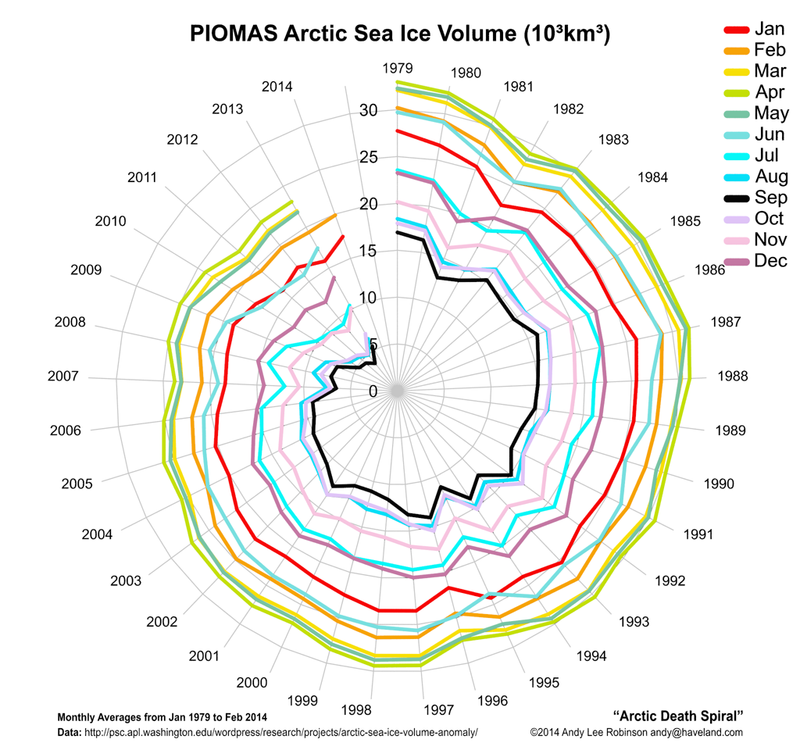 For what it's worth, I think the climate changes in steps rather than smoothly, and it seems to me that the Arctic ice has stabilized at a new, smaller but more or less stable, volume and area for the time being. Dec 9, pretty soon after your debate I think. It is also, however, right after my town got flooded by storm surge - which naturally makes this question imperative to me. I'm a layman. I thought the strong argument was the observational data - death spiral. As to the methane - I don't know enough to comment. The good thing is such a near term prediction means we will soon have the answer. While I'm convinced that the methane "burp" thing is hype, I'm not as convinced that methane overall (permafrost, all those pools in Siberia (have you seen them), fracking flaring, the recent revelations about leaks from old wells, among others) is so trivial. But on the Arctic, I think people should notice that there has been a steep increase in melt over the last few days, so we are now looking at something that is more like 2012 than 2013. In a changeable and unpredictable Arctic, there are many variables I don't understand, but the idea that we know it will not continue to melt at an increasing rate and there is some kind of stability seems wrong as well. I'd go with we don't know, but not with the idea that there is a new stable level. I realize that's not what you said, mt, but I think it's important to wait and see from both ends. On the whole, most high-end predictions of climate danger seem to be the ones that are playing out, but not at the Beckwith level. I'm also not comfortable with dismissing Wadhams, though most forms of geoengineering seem dangerous to me. In our techno-obsessed world, we probably will have some unwise fixes with unintended consequences. "For what it's worth, I think the climate changes in steps rather than smoothly, and it seems to me that the Arctic ice has stabilized at a new, smaller but more or less stable, volume and area for the time being." How long would the time being be for this ? When I step out of my front door and look left, I see the docks which my town is built around. When I stepped out of my front door in December I saw a crowd of people gathered at the end of the street. - which missed my house by a stones throw. The majority of local sea defence was high enough, (the inundation was the result of a partial breach) but only by a matter of a couple of inches. The whole area is only marginally above sea level, and it's going to be problematic over the coming years - which is why I want to know about arctic sea ice so much. Not very long - but sea ice doesn't determine sea level. If it's not a few years, it's hardly a plateau is it? I don't know. My hunch is more than ten and less than thirty years, but it's pure hunch. Don't cite or quote that without the word "hunch", please. I won't forget the hunch. So, that's still ahead of IPCC projections somewhat isn't it ? I think IPCC gives an ice free summer by 2050 at the earliest. I've been ringing and mailing the authorities in my area to see what projections they use for storm surge and flood in the medium term, and it seems they pretty much go by what the IPCC says on this, so I'm still less than confident that they are going to be pouring enough concrete and bulldozing enough earth in the coming years to keep my doorstep dry. I was confident that The Authorities already knew what the sea was going to do, that it woud be super slow, and preparation should be easy. In fact I recently got in touch with a local MP and he said exactly that. Now, however, I've got doubts. I can say that the mainstream party politicians are moving seriously on the issue whether they have the exact take on climate change or not. We also got a storm surge of UKIP politicians lately, but not enough yet to stimmy sea defence spending. One of the problems with the economic shock of recent years is that people are turning to organisations like UKIP - who wish to ban climate change from schools. Trying again. The sea ice problem is completely separate from the sea level problem. Archimedes, you know. Floating ice displaces exactly the same volume of water as the liquid water it turns into. There are some very minor caveats, but basically you can ignore melting sea ice for purposes of understanding sea level. My hunch about sea ice has nothing to do with sea level rise, which does look to be gradual and predictable, but gradually accelerating as well. There's no sign of an end to it without a pretty much total stop to carbon emissions, and about ten times the present rate of increase is all too likely on the cards, but probably not for some decades. No need to get huffy, I never said sea ice was a problem in the way you seem to think I said. You can't notch up a "genius talking to idiots" point there I'm afraid. You noticed the bit where I'm talking about storm surges ? ie increased wind, precipitation, frequency etc. ? The sea ice problem is completely separate from the sea level problem. Completely? Right next to the sea ice is Greenland. No sea ice => more warm air over Greenland => more sea level rise from Greenland melt. A hiatus? Methinks that's quite some statistical nonsense: Here is another PIOMAS graph with some non-linear trend curves. They point toward ice free September minimum between 2016-2021. No special expertise or science needed beyond knowledge of a statistics tool. Methinks this is all one can say. A hiatus? Methinks that's quite some statistical nonsense: Here is another PIOMAS graph with some non-linear trend curves (via Neven's blog). They point toward ice free September minimum between 2016-2021. No special expertise or science needed beyond knowledge of a statistics tool. Methinks this is all one can say. I wouldn't be much surprised if it takes until 2025: 1) The curve is quite noisy and 2) The weird arctic weather of 2013 hints at possible weather system reconfiguration (more clouds, less melt). We'll have to watch the polar cell for some more years. OTOH I wouldn't be much surprised by 2016 either. (more clouds, less melt). We'll have to watch the polar cell for some more years. OTOH I wouldn't be much surprised by 2016 either. In case any of you missed it, an expedition left Tromso a few days ago to investigate methane on the East Siberian Shelf. Both Prof. Semiletov and Dr Shakhova are involved. As is @IanMBrooks, who says he has fixed the Twitter so will be tweeting from the Arctic. Sorry, occupational hazard. However, you don't seem to have acknowledged that the relationship between sea ice and sea level is tenuous and indirect - you express your personal concern about sea level and your science question about Arctic sea ice decline. They are not closely coupled. Okay, that's a loose coupling, but I could argue that it actually is a negative feedback rather than a positive one. More open water upwind in cold seasons means more snow accumulation. Consider the climate of Buffalo, New York. On the other hand, it would also enhance melting as you point out. On net I consider this a minor distraction of uncertain sign. I'm just trying to make sure the questioner understands that what happens to the Arctic, good or bad, is not closely connected to what happens on his beach, good or bad. The problems at the beach are much more inexorable and certain. As you wish, here it comes..... Ice melting into the sea causes no immediate average sea level rise.... Except for thermal expansion. Increased coastal glacier erosion and flow, precipitation, air temperature, storm intensity and frequency, wave activity. Lowered polar albedo, salinity. All these seem intimately connected to me and the future of my street. Hmm, not quite the beach - it's a port. If all they had to think about was a 3mm rise a year it would be easy, it's the storm surges and inland rainfall that are problematic. Did Nafeez Ahmed not give up on the methane threat? What do you think about the boinc climate modelling project? Worth doing? John, if you're still around, wanted to mention that I too am close enough to sea level to share your concerns. I concur with Tobis "hunch" of 10 to 30 years. I'm thinking if possible I should sell in five years, though that's selfish and materialistic of me, shuffling off what is going to be an obvious problem. However, here near downtown Boston we are getting a whole slew of new highrises with base around 3 feet above "normal" high storm tide. Figuring that the confluence of a full moon (new moon in winter) and a very big storm (northeaster here, cyclonic further south) could overtop the 3 foot safe zone by a foot or two.